Today's oil price fell 2.5% in mid-morning trading after the U.S. Energy Information Administration (EIA) reported ugly supply numbers for Thanksgiving week. At 10:35 a.m., five minutes after the report came out, the WTI crude oil price was down 2.5% and trading at $40.82 a barrel. The U.S. benchmark is coming off of a rough month after falling 12.3% in November. It's now down 32% for the year. The Brent crude oil price was also volatile today (Wednesday). The global benchmark dropped 2.1% to $43.50 a barrel. 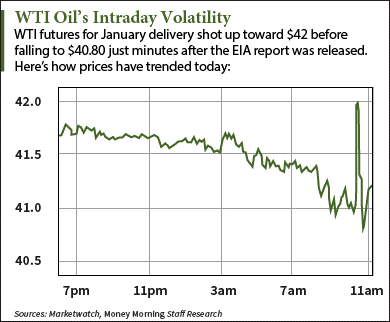 Today's oil price decline came after the EIA reported its 10th-straight week of supply increases. U.S. inventories rose by 1.2 million barrels last week. Analysts polled by research firm Platts expected inventories to fall by that same barrel amount. At a total of 489.4 million barrels, U.S. oil stockpiles remain at 80-year highs and could come close to surpassing the 500 million mark by the end of 2015. The losses come just two days before the 168th OPEC meeting in Vienna. On Dec. 4, officials from all 12 members will come together to discuss the current state of the oil market. Attention will be focused on Saudi Arabia, the de facto head of OPEC and leader of the cartel's yearlong strategy to edge out competitors with overproduction. The meeting will likely be tense as desperate OPEC members like Libya plead for supply cuts. After all, Libya's export-driven economy can't survive when oil prices aren't near $100 a barrel. With the highly anticipated meeting coming up, many oil investors are wondering if OPEC will cut oil production as we move into 2016. Alex McGuire is an associate editor for Money Morning who writes about energy. Follow him on Twitter for the biggest updates on oil and natural gas prices.